Blasteroids is a free program that is aimed at making your time on the Internet more enjoyable. The program allows you to ‘destroy’ any website using the mouse pointer as a shotgun. This program is compatible with Internet Explorer, Google Chrome, and Mozilla Firefox, and, in order to activate the program, you have to press the Ctrl+Shift+A key combination. 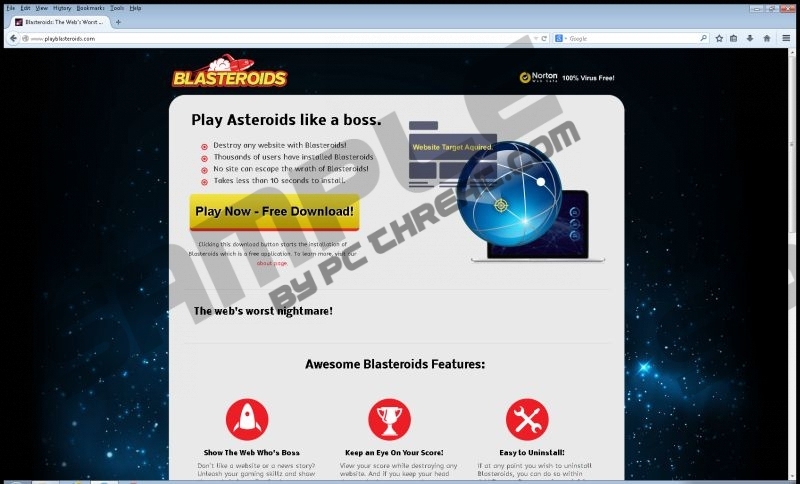 Blasteroids has its official website where the user can get acquainted with the features of the program; however, the official website, which is playblasteroids.com, is not the only source of the program. Blasteroids can be bundled with other free programs, too, and, if you want to prevent the installation of optional programs when installing some program, you should attentively read the license agreement provided by the installation wizard. Blasteroids was published by Acute Angle Solutions and is very similar to free programs such as Websteriods and Disasteroids. After installing Blasteroid, you may find that a new process, called BlasteroidsService.exe*32, is added to Task Manager. Blasteroids is also known as an advertising supported program. This free program, resembling a game, may display third-party advertisements, which include web banners, in-text advertisements, also known as in-line ads, pop-ups, interstitial advertisements, and the like. This characteristic is provided to you on the first page of the installation wizard, and, if you want to get rid of suspect advertisements, simply remove Blasteroids from the computer. Every time you click on a Blasteroids advertisement, you start interacting with a third-party, which is not endorsed by the developers of the adware program. Blasteroids does not accept responsibility for your correspondence with third-parties and have no control other their activities and privacy policies. According to the description of the program provided by the installation wizard, Blasteroids serves you with high quality ads; however, you should be alert to the possibility of being provided with some deceptive ads. Due to the fact that you cannot be sure to what website you will be redirected by Blasteroids, you should be very careful when you encounter a pop-up advertisement. Below you will find our instructions that should help you uninstall Blasteroids but we recommend that you install a reputable spyware and malware prevention tool. We suggest using SpyHunter because this program can remove Blasteroids and, most important, safeguard the system against multiple threats, including Trojan horses, rogue anti-virus programs, browser hijackers, and many other threats. You should not keep the computer unprotected because every time you connect to the Internet, you put your operating system and personal information in danger. Select Control Panel and select Uninstall a program. After removing Blasteroids from the browsers, you should implement a reputable scanner so that you can be sure that computer contains no files related to this program. Quick & tested solution for Blasteroids removal.